After Made To Stick, I moved onto another professor’s book on how to convince people to do stuff. Cialdini approaches this from a different angle, however. He’s primarily interested in what makes people do things that they really don’t want to do. 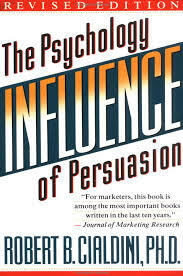 In particular, he likes to examine the psychological underpinnings that power the tactics of salespeople, con-men, advertisers , marketers, etc. The book is quite fascinating. It perfectly explains why you sometimes get that weird trapped feeling where you know you’re making a mistake, but you just don’t feel able to back out. He explains why people give money to Hari Krishnas in exchange for flowers that they immediately throw away or why car salesmen risk annoying their customers by abruptly changing the price they initially offered or why people can’t leave a Tupperware party without buying something or how the Chinese used essay contests to brainwash American PoWs during the Korean War. The book is full of people who’re manipulated–and often know they’re being manipulated–into doing things that are harmful to their own self-interest. I love this book. I experimented with some of its techniques at the Harvard Law School Negotiation Workshop by employing them against future lawyers. If you ever want to see a lawyer’s head explode try using the four-walls technique on him/her. It is absolutely hilarious. North Korean negotiating tactics work equally well, though they tend to provoke much more consternation. Haha, this sounds great. I’d be surprised if they didn’t teach this book in many business and law schools. I actually think someone assigned excepts of the book for me to read at the Kennedy School of Government of all places.